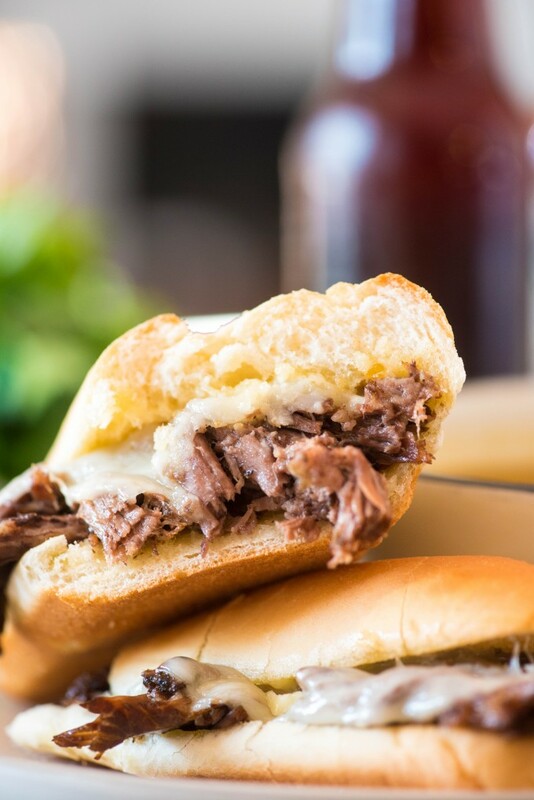 These Instant Pot French Dip Sandwiches are insanely good and the perfect recipe for pressure cooker beginners and experts alike! 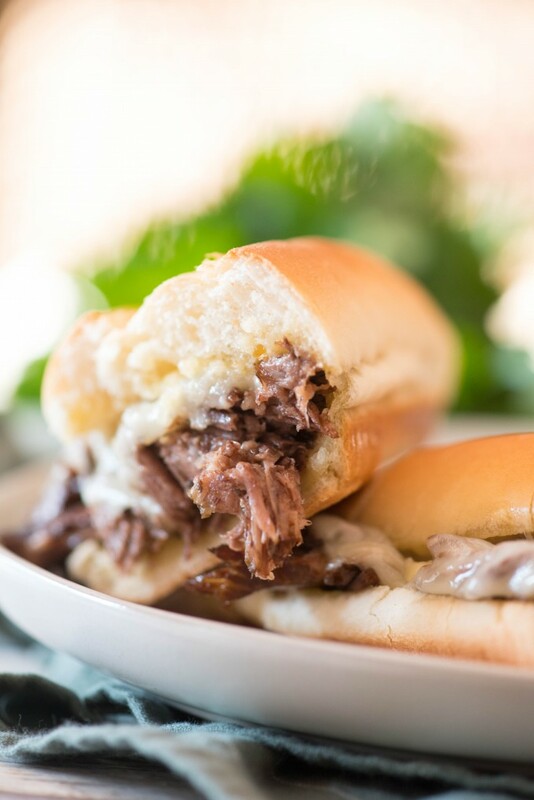 Tender chuck roast literally falls apart, and is piled high on a bun with provolone cheese, and dunked in a tasty, yet simple, au jus. I have sort of a love affair with any kind of beef sandwich. I just love the combination of tender beef with gooey cheese. Throw in a savory sauce, and I’m in heaven. 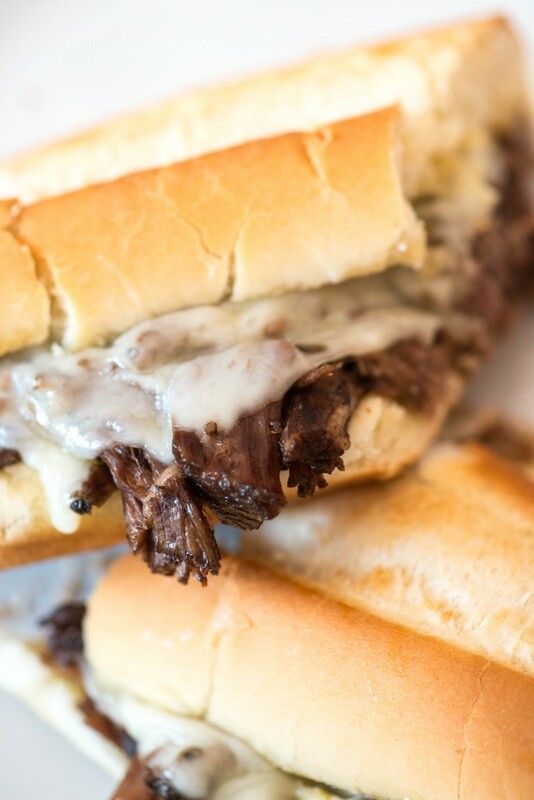 These Instant Pot French Dip Sandwiches hit all three for me- pure bliss. I’ve been craving something in that vein lately, so I knew exactly what I wanted to do when chuck roasts went “buy one, get one” at the grocery store. 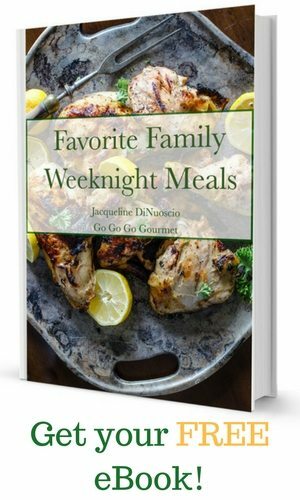 So simple to make- a handful of basic ingredients, fresh bakery sub rolls, and deli-sliced provolone are all you need for these melt-in-your-mouth sandwiches that are perfect for weeknight dinners or easy weekend lunches. If you don’t have an Instant Pot (but c’mon, if you’re flying by the seat of your pants, you really need one), you could do this in the slow cooker too. LOW for 8 hours! For this recipe, all you really need is an Instant Pot. I have this 8-Qt one, which serves my needs well. It’s a great size for soups and stews, but also is large enough to allow me to make a whole pork shoulder (that recipe is coming soon too). Are you set to “sealing” on the top of the lid? Is the ring seated properly? Is the lip on the actual pot where the lid sits clean? If your answer to all of those are yes, try just pressing down on the lid and seeing if that little red pressure indicator pops up. If it does, and stays up, you’re golden. You might actually want to start with that and work through your question-answering-troubleshooting from there. Season both sides of chuck roast with salt, pepper, garlic powder and oregano. Press the SAUTE button on the Instant Pot. Add the olive to to the inner pot and heat to hot. Add the chuck roast to the pot and brown for 4-5 minutes per side. Remove chuck roast from the pot and place rack into post. Pour in beef stock and place browned roast on the rack. Place lid on top and lock. Set top valve to Sealing. Press the Meat button and set for 60 minutes. When the timer is done, let naturally release for ten minutes, then quick release. Remove lid and lift out rack. Transfer meat to cutting board and shred. Turn the Instant Pot to Sauté. Sprinkle the flour over the remaining beef stock. Whisk vigorously until flour is completely incorporated. Bring to a simmer until slightly thickened. Preheat oven to 350 F. If desired, spread a sub roll with garlic bread spread. Pile bun with shredded beef. Top with 4 half slices of provolone. Transfer to a baking sheet and repeat with remaining buns. Bake for 6-8 minutes, until bun is toasted and cheese is melted. 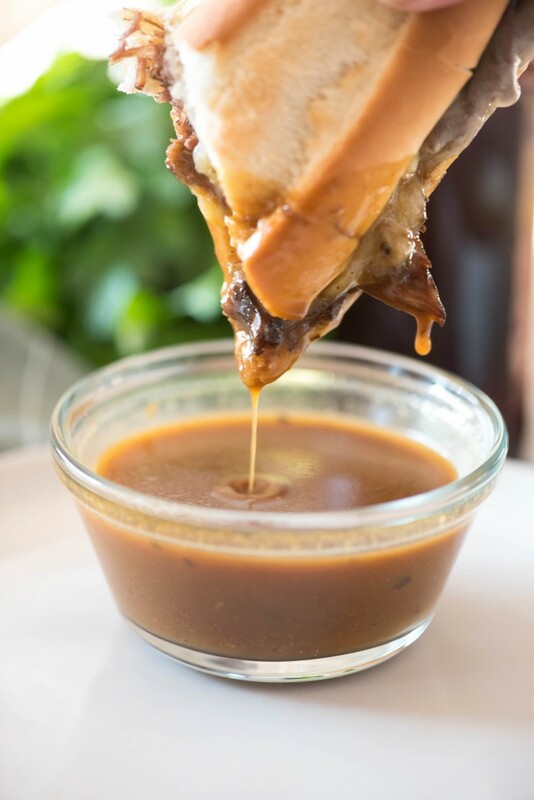 Serve with hot au jus for dipping. Thank you for your specific instructions. 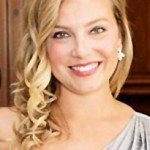 They are very helpful for a new Cosori instapot user. When do you add the wostershire sauce?